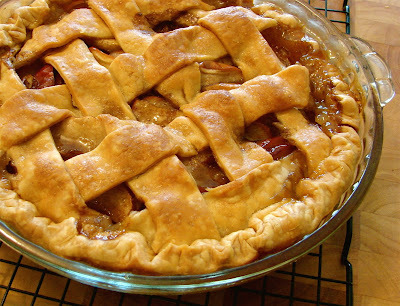 The caramel apple pie seen in this video recipe was used as a test for Pillsbury Pie Crusts. I've wanted to give them a try, so I could post a review on my American food site. I had heard anecdotal evidence that they made a very respectable crust, and wanted to see for myself. And, I felt like pie. If you're going to test a pie crust, you have to go with the quintessential pie…apple. But, I didn’t make the traditional apple pie, I went with this caramel apple recipe which is super easy, but very unusual in its construction. It contains no flour or other starch in the filling to bind it together. The texture of the filling is basically caramelized apples, glued together with a very glossy, very clean, just thick enough, apple syrup. I leave the red peel on the apples in this pie, which not only adds nutritional value, but also gives the filling a beautiful color. I used Gala apples, and after the pie was cooked, the skin was perfectly tender, and almost disappeared into the filling. Be sure to let this pie cool completely! Since there is no starch to bind the apples, the caramel/apple syrup in the filling will not set while warm. To me, this is the purest and most intensely flavored apple pie recipe there is. The interesting thing about this recipe is the way the caramel sauce is poured over the apples and the lattice crust. You know how with a traditional apple pie some of the apple juices will caramelize as it bakes and bubble out of the pie and bake into and onto the flaky crust? You know how awesomely chewy-flaky-sticky-crumbly that part is? That's how this whole pie is. Enjoy! Incredible - the american apple pie without starch; Chef now you totally won me over - I think I will try to reproduce this, with few extra walnuts added. Btw. using unpealed apples in your recipe is probably required - pectin for thickening marmelades, jams and some low-fat yogurts is actualy extracted on industrial scale from apple peals. (Pectin is great, it does not muddy up the flavor of fruit). That's one Godly looking pie. Yum! The Pillsbury crust looks quite good! I should try it too. I usually make my crusts from a really old recipe my grandma has that calls for flour, lard, ice water and salt. yeah, I should market this as "low carb!" I think I'll try this this weekend but since piecrust is one of the 3 things I bake well I'm using my own. Do the ingredients on the Pillsbury crusts read like a chemistry text? No, actually it's not too a bad list. Of course, there are a few mold retardants and the obligatory Xanthan gum, but it does contain lard, which would explain it's very decent flaky texture. Homemade is of course better, always, but for many, this would make homemade pies a reality. Looks good. I will try this with my own can't be beaten pie crust. The ingredients are very close to my own apple pie (I use more cinnamon and a little nutmeg) but your method is intriguing and I can hardly wait to try it. I believe that brown sugar MAKES apple pie. Also, I must say that most apple pie recipes call for much less sugar and they end up drab and sour. This one looks yummy! 1) What would you suggest to make a blueberry pie with this same technique? What sort of syrup would you recommend? 2) Are there any refrigerated crusts out there that do not contain lard? Lard is rather repulsive to me so that's why I ask. im gonna make the pie tonight. Looks great. Hey, didnt know where else to conatct you though but through a thread. Do you have any recipes including sweet vermouth? Not sure if this would work with blueberries. I'd have to experiment. The caramel cinnamon flavor works great with apples, not sure about BB's. Also, you can sub butter for lard, but doesn't produce the same flakiness. I don't think blueberries in filling will set without additional thickener - I sometimes make a luxurious pankake syrup, by combining one package of frozen blueberries with one of rapsberries with 5-6 spoons of sugar, and slowly warming up the mix and stirring warm until the fruit liquifies into the sugar (no boiling, no added liquids!). It tastes jolly good - but stays rather syrupy when it cools down. But you can try to mix some dried apricots into your blueberries - cut them into thin noodles so that the dried appricots dissolve in faster. Apricots are very rich in pectin so they should act like a natural thickener in your blueberry filling. (Another reasonbly good thickener are dried figs but they have seeds, it affects the texture). I am currently working on caramel apples to get my family in the fall and Halloween mode, so your caramel apple pie vid was an awesome coincedence! Not too sure about using Pillsbury pie crust though. I have tried it, and I can certainly say that it has a decent texture. Flavorwise, ehh. I stick to making my own pate brisee - with high fat European butter. I know it's a splurge, but I can't help it...I'm darn picky about my pie crusts. All the necessary ingredients for your recipe are in my cupboard. I'll have to write in and tell you how it worked out! You need to do a vid on how to make the ultimate thin-thick ice cold milkshake to go with this tastee recipe vid..
Yum and thanks again for inspiring me to cook again! I made this last night. Wow. It was so easy and good. The crust was great, actually, and looked so inviting. I might use a few more apples. I thought it was a bit sweet... yet the amount of caramel sauce was right on. Any suggestions? Overall, it was truly home made tasting and looking. My son even said: "I could make that. And I will." Now THAT'S amazing. Many thanks!! Sure, I think I say in the clip that I like fewer apples, you can easily add a few more. Thanks! not sure. Did you peel apples? let it cool? Cook it long enough? Mine was not thick, but wasn't very watery either. Maybe your apples were a different variety? Red/Gold Delicious tend to be wetter I've found. Making this as I type... it's in the oven and smells delish! The caramel sauce is so VERY yummy... I can't WAIT! great! make sure you cook it nice and golden-brown, and let it cool ALL the way before eating. I did... it was SO good! Thanks again! :D Hey, Chef John. I tried the recipe and it came out with awesome results. I'm 15 years old, so when my parents came home after I cooked this, they were stunned. My mom said she was jealous that my first pie turned out like this(it was pretty AND delicious). So, thank you. :) I've tried a lot of your recipes, but this is the first one I decided to photograph. Okay, I made the pie and it was really tasty and good. I even sliced the apples like you (and almost everyone else does). I gotta say, though, that I really prefer to cut each apple quarter into two or three slices and then cut them crosswise. This way, when you take a bite it's much easier to eat and there are no long slices to flop across your chin. Maybe I'm just a messy eater but I gotta say my apple pie is always well received. Thanks for the recipe--I will make it again. Love your blog. I am eating your pie right this minute. (One hand on keyboard; one on fork) It's delicious! It was easy as -- well, pie. Wowwie, this pie is cooking in the oven as I type. Can't wait to taste it! I'm loving your site! Thank you for this great recipie. My family had our early Thanksgiving with extended family this weekend and I made this pie to bring. It looked so pretty and tasted amazing. Everyone raved about it and lots of request for the recipie were made. So if traffic on your site increases this week... ;). It is simple and taste like apple pie, just better than usual. I also used the idea of the carmel syurp on a dessert for tonight, with great results. I made a tart with pears, cranberries and pecans then drizzled with the syurp and baked. Yum! Thanks again. Chef John, I used your Mom's crust recipe and made the key lime pie and it turned out great. I am wondering if I use the same crust recipe for this apple pie should I pre cook the crust as in the key lime demo? Chef John, I made this recipe and the crust and flavors came out perfect but the apples stayed a bit too crisp. Any suggestions for getting the apples to soften up a bit without overcooking the crust? I was thinking of trying smaller slices or less apple in general.. I was using gala apples. yes, thinner slices OR you can cheat and saute the apples for a minute in a little butter and add them...even tastier! I made this with apples from my tree - it was absolutely incredible and very easy to do!!! LOVED IT!. I will definitely try some of your other recipes!!! Wish I could add the picture I took of it. Hey i only have 4 green apple in my frig... would it also work with this recipe? Would you mind scribbling down you recipe for the pie crust - where i live access to ready-made ones is painfully difficult and cost prohibitive too. Just the ingredients and the proper ratios to get the perfect crust for this pie recipe. Well I guess I just didn't look around enough. I just found you Tres Leches Cake recipe and thank you thank you thank you. Now, I can make it myself and won't have to spend $28.00 a pop at Pierre's in Chicago. Every recipe of yours I have tried has turned out simply wonderful. Most of your recipes are also so very simple. Congrats on your win. Chef John, you really deserve the recognition. I made your mom's Tres Leches Cake for my husband's work buddies and now they all want the recipe. I wish you would do a cook book. I love your videos but wish you would also put in writing in addition to the ingredients the prep. I had told my husband (also named John) to save me a piece, but the cake went so fast that I didn't get to try it. They said it was divine. My foodwish is for you to do a cookbook and to sign a copy for me. Please consider doing a cookbook. Include your Split Ham & Pea Soup, Tres Leches Cake, Asparagus with ham, garlic & lemon and oh heck, just try and cram in as many of your wonderful recipes as possible. I would buy a cookbook from you in a heart beat. If I could get a signed copy that would be my biggest foodwish. Simple is best, so many recipes you have I have tried and they are simple, fast and elegant. Forget the Bam, forget the yummo Chef John, you rock! ps: I don't sign love very often. I am only 14 and have not done too much cooking since i left my grandma's house. I always had my grandmothers guidence when cooking. I always wanted to know how to make a pie homemade. i got a ice cream maker and was looking on you tube for more help and tips the i saw our link, typed it in,vand before you know it ive read and watched every video on yur site. my favorite was the key lime pie but i couldnt find the ingredients posted? i dont know but if you could post it that would be great. i find the video very helpful. i find all of them verry helpful actually. my mom is taking me to the store tomorrow and i plan on making as manny of your foods as possible. but i think i will start with the apple pie just because i love it soo much!!:p... you have in spired me to try new things and how fun it is to cook. And how funny you can make things look (like the cake flower pot that im going to do for my grandma next time i see her;D haha). Thank you for the help and inspiration i needed. I will comment again when i bake the pie. Looking forward to making everything you have showed me. the key lime ingr are under the video. thanks!!! 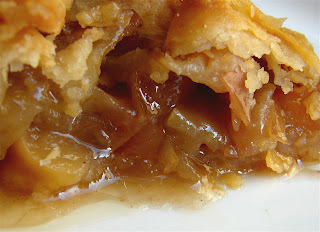 I'm trying to get that Apple Pie Recipe but i cant get it, i am sure missing something www.foodwishes.com dont work for me maybe you can send me a link. Thanks a lot for your recipe. It's the best apple pie I've ever eaten. Can't wait to see how it tastes. I never made pie before and I found this recipe quite simple, which encourage me to try it. The only bad thing is that some of the caramel spilled the oven and now I'm trying to get it off....There's still some there and it's getting on my nerves...any tips? This pie was a total hit with my family. They preferred it over my mother in laws applie pie which is a huge feat. As she has been baking for 50+ yrs. Hey Chef John. I made this yesterday evening, and now there's only one slice of the pie left! I was wondering, when I made the caramel sauce, it didn't turn out as watery as yours did in the video. Also, some of the sugar didn't really dissolve. I let it come to a boil like you said before turning it off. Also, I made the caramel sauce before slicing the apples and all that prep. Any thoughts? Please answer. Thanks. sorry, not sure i understand. If it boiled the sugar must have melted. I made this apple pie over the weekend and it definitely is the best pie I have tasted! Everyone loved it too. Thanks Chef John! free at last, free at last....from peeling apples for pie. thank you, chef john. In his comments, he stated that he used Gala apples. Great recipe but use a drip pan underneath. The pie sounds delicious. I am wondering how the peels came out since the apples went in unpeeled. Where they soft like the apples or where they pliable like skins when the pie was done baking?..Thanks you for any info. Before I spend my time making this pie I would like to know..Thank you. Mine were soft, but you can peel first if you want. Enjoy! This may be a horrible question, but can I use those disposable aluminom pie pans for this recipe? I have everything but the glass pie pan :( I sooo want to bake this pie! Hubby says "BEST apple pie I've ever eaten"!!! Wish I could post the picture I put on Facebook here. It's gorgeous. One thing I didn't do was poke the apples to see if they were done, as it's a bit undercooked, but still has the great taste. Will see if I can zap it in the micro for a bit of softening, and then back in the oven to crisp before serving the rest. I tried to post earlier, but for some reason my comment/question didn't show up :( My pie turned out great, but I had a soggy bottom crust. It may have been from soaking the apples in a water/lemon bath to keep them from turning color. The sauce was heavenly, but I think added to the moisture creating the soggy crust. Any ideas to prevent this? Recipe was yummy though. I'd toss the apples in the juice, but not soak them in water. I didn't use the juice, as I cut and filled the crust very quickly. I used 2 gala & 3 honey crisp. It was heavenly brown and crisp with a firm well defined appley center. Don't soak the apples and try again. I made another last night and it's gorgeous. I made this pie exactly as shown, except I used Macintosh apples, since I already had a bag full and the crust and wanted to try the recipe. I agree the bottom crust was soggy, and wasn't excited about the skin. Still, the top crust...SUPER YUMMY. I did squirt lemon juice on the apples, but did not soak them. The next day was when the pie seemed to come together. And we had already eaten half of it. After almost 24 hours of refrigeration, the bottom crust didn't taste as soggy, and the skin on the apples was less obvious. I think the key to this pie is to get it into the fridge as soon as it cools off enough, and then try not to think about it until the next day. I loved this Apple Pie, I am a beginner cook this was so easy for me!! Plus my brother in law who never comments on anything said WOW!!! I appreciate your videos, it helps to see you do it. P.S. I used 2 honey crisp and 1 granny smith- had a tart/sweet effect!! LOVE IT! Thank you! I have been dying to view this video, but I also can't view it. Will you please take a look at it Chef John? I've tried this one and it was AMAZING. Thanks Chef Jonh. i made this today and trust me it came out very well. i made two pied and was so excited. Love your recipes. the link should direct you to a picture of those i made. Do you like this apple pie filling or the Easy Apple Pie Filling better? They're both very easy, but I don't know which one would be better. This filling is just perfect! You can vary which apples you use, and it just looks so pretty on the table. I made this recipe a year ago and it came out fabulous! Best apple pie ever. Then I made it yesterday *whomp whomp* - soggy city. I poured out a cup of water from the pie! The crust was soggy and fell apart. The apples weren't that soft either. What happened? I used 6 Braeburn apples, red skinned, not peeled. No pre-soaking of apples. Followed recipe exactly. Help please! This sounds great! Would the caramelization process work just as well for fresh pineapple, too? Hello Chef John! My sister and I followed your recipe but when the pie was done and cooled there was about a cup of excess liquid left sitting around in the pie. Was there something we did wrong or....? CJ...would sand pears work in this recipe as they are much firmer and almost like an apple? Have many here and it probably would go good with caramel sauce! If never had a sand pear, so not sure, but you could saute a wedge and test the texture. Cooked pears are much grainier than apples. I made this the other night, and it was a wonderful apple pie. I did follow the directions but had a mishap, my pie was super extra juicy. In fact it was so juicy after we took out our 3 slices to eat (cut pie in 8 btw) there was a flood of juice into the vacant space. Just as tasty as a normal pie though, don't know what went wrong. I had an idea though, and boy am I glad I screwed up somehow! I held the container gently and slowly tipped the juices into a small 1c plastic container, covered it and set it in the freezer. The next night when we dished out the pie I was able to scoop some out onto each piece. *yum* It was like apple pie sorbet! Even thought it had been frozen a day it was scoop-able with a normal spoon. Totally delicious! It wasn't too sweet, with a very apple prominent flavor. Any idea how I can get this goodness without making pie first?? What if I don't screw up again and get just get a great apple pie and not a two for one deal? How should I go about making this ahead of time? Great recipe. I made this pie 4 times and always good. Thanks for sharing. This Pie done made me cry. I made it, the apple filling is still crunchy, hope there is a precooked filling version, so the choice of apple wouldn't be too much a problem. Absolutely delicious. Made this pie for me and my husband and he loved it. Made a pie for parents and then a pie for neighbors. They all loved it. I did use the Pillsbury dought which made it so simple. Now what to do with all my extra apples from my neighbors tree. Chef John can you please help me figure out how to translate your Carmelized Apple Pie into a freezer recipe so I can have it anytime of the year? Please please help me convert. Thanks. Hi CHef John, what happened to the video? It would be great to see you prepare this.